Thinking of studying English in the UK this year? Whether you’re planning on coming for a week or a whole year, EC Oxford has so many things to offer every learner. Here are 3 reasons why EC Oxford is the perfect place for you to study this year! 1. We have FANTASTIC teachers and staff! For our teachers, teaching English isn’t just a job – it’s a passion! One of our values, not only as a school but as a company, is to go the extra mile in order to ensure all our students have the best possible EC Experience. Don’t just take our word for it, the most common comments we receive from our students when they graduate are regarding the teachers and staff. 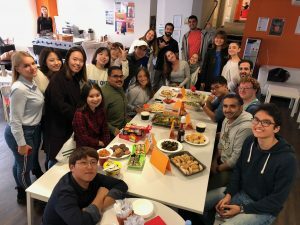 For international teachers day our students put together a video for all the teachers and threw them a surprise party in the Students Lounge! 2. Our student led Social Programme. This is something we are very proud of here at EC Oxford and invest a lot of thought into. Every week the students vote for ‘The Theme of the Week’ and we offer activities based around their choices. Previous weeks have included ‘British Culture Week’, ‘Grammar Week’, ‘Harry Potter Week’ and the very popular ‘Food and Drink Week’. 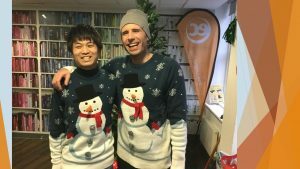 During these themed weeks we offer a variety of free classes such as Pronunciation or Vocabulary clinics, as well as social events like outings to visit famous sights in Oxford, sports events and restaurant visits. Have a look at our Instagram page ‘ecoxford‘ for lots of pictures of our social programme! 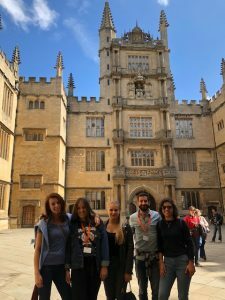 These events and classes are a great way for students to make friends, see some wonderful places around Oxford and participate in some great events – such as debating at the world famous Oxford Union or the favourite Oxford pastime of punting on the river. 3. We’re a BIG family! As we are one of the smaller EC Schools, we are lucky to be able to get to know everyone really well. Many of our students have formed lifelong friendships here and there is a great community feeling in the school. This is enhanced by our Student Ambassadors who take our new students out for lunch on their first day of school and help them with any questions they have about the school or the city. 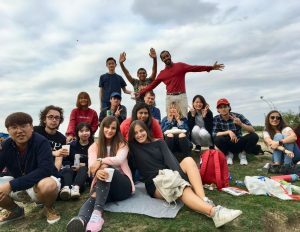 It is wonderful to see students of all different nationalities eating lunch together and communicating in English – study English in Oxford and make friends from all over the world! There are many reasons why EC Oxford is such a great place to study – what are your top 3 reasons for studying at EC Oxford? Do you keep in touch with the friends you made here? What’s your best memory of your teacher? Comment below!